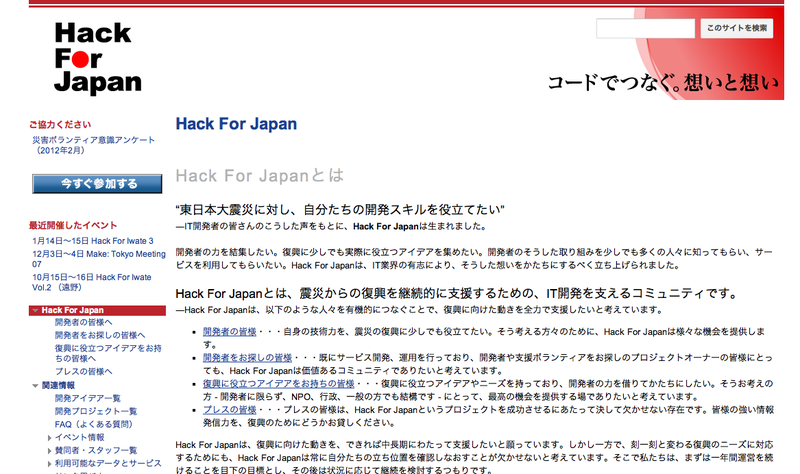 I was asked to write in English about how we started Hack for Japan back in 2011, so will be translating the blog post I wrote in Japanese here. 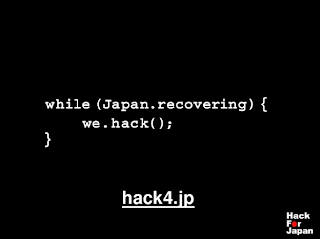 Hack for Japan is a developer community that we started immediately after the Magnitude 9.0 earthquake, tsunami and nuclear power plant accident hit Japan in March, 2011. Many developers wanted to utilize their technical skills to contribute to responding and recovering from the disaster that hit our country. 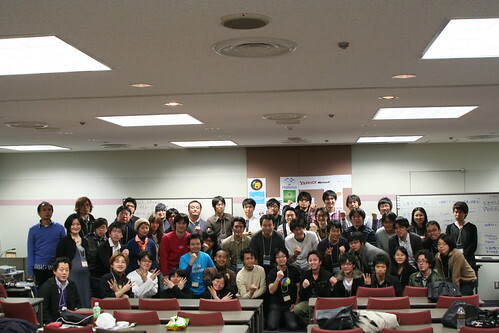 This is a group photo from our first Hack for Japan hackathon in March 21, 2011, 10 days after the earthquake. We organized hackathons in 4 venues on that day, and continued them in May with 6 venues, July with 5 venues, and so on. I was in Austin for SXSW when the earthquake happened, was communicating with everyone in Japan online till I got back to Japan on the evening of 3/17. In fact it was my birthday, but I completely forgot about it due to all the disaster situation. My colleague +Takuya Oikawa was in Fukuoka then, I talked with him over the phone from the airport and decided that we are going to host the ideathon / hackathon on 3/19-21, and I went to our office in Roppongi directly from the airport and started working on planning the event over night. We hadn't decided anything at that point- what technology we will use for the online ideathon 2 days after, we hadn't gotten any of the venues for hackathon. At 3/18 2:10 AM, I sent an email to our Google Developers Experts (GDE) mailing list - a group of developers I worked very closely with, and started getting feedback and advice about the Crisis Response hackathon we were planning to host. 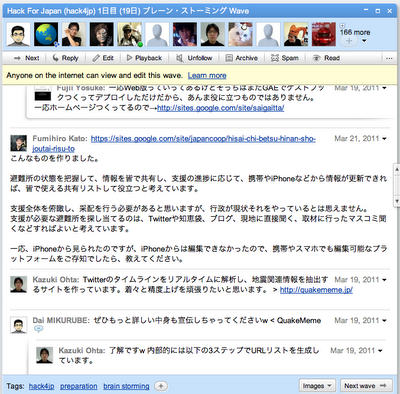 Back then, Google Wave existed, and so I wrote that "I am thinking of using Google Wave as a tool for ideathon". +Atusi Nakamura, who was then Google Wave API Expert replied "I think Google Wave is an excellent tool to expand on ideas, but hard to consolidate, select and concentrate. You should probably use it together with Google Moderator." 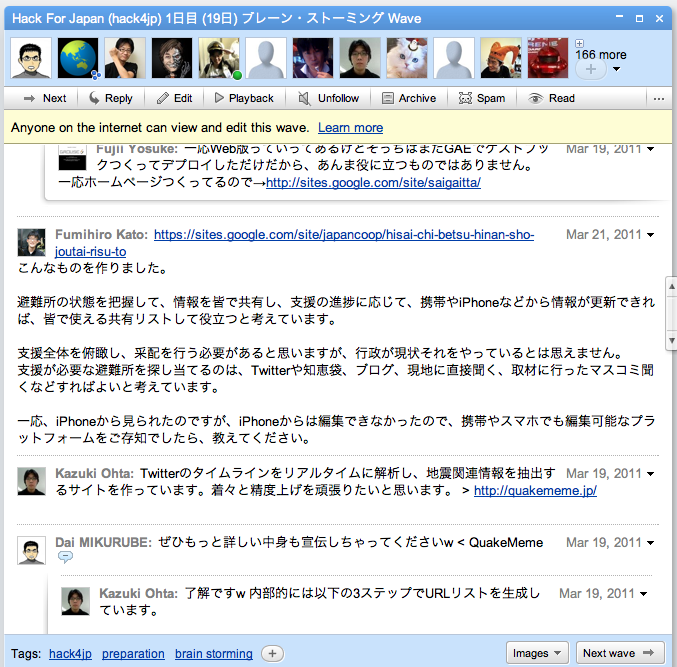 His advice was exactly right, and it would have been really hard to run the ideathon if we only used Google Wave. Another GDE +Yukio Andoh started creating a slide right on that day entitled "Crisis Response UI - what UI+UX designers can contribute to crisis response services" and made it public. The email threads I had with the GDEs during these several days went over 100 posts. I won't be able to introduce everything here, but it was a crazy amount of emails. I would like to thank all of the GDEs for your advice and support- without your help, we could not have made this happen! "Count on me- I will run the whole event in Kyoto. 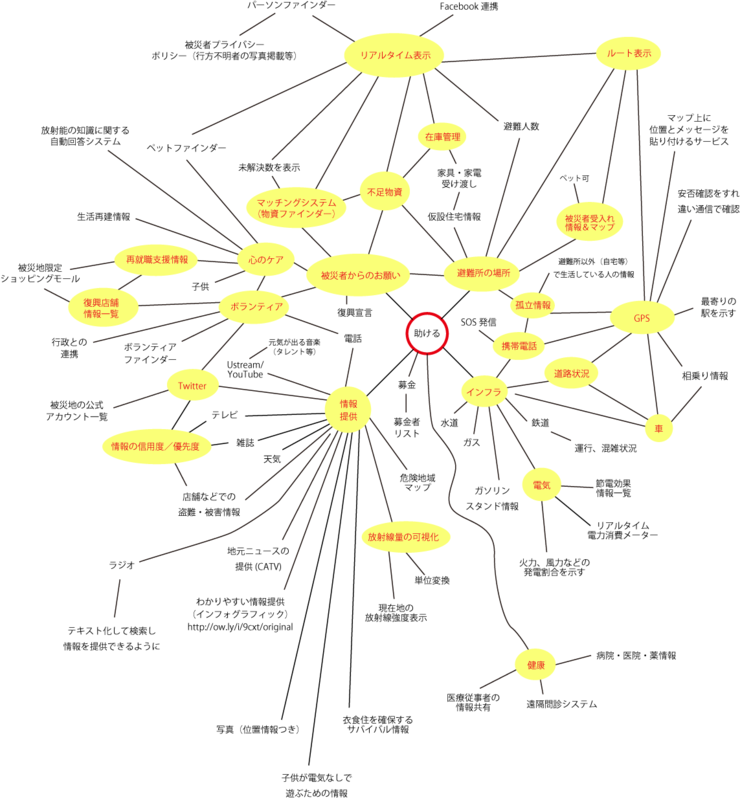 My organizational experience of Hackathon is highest among anyone in Kansai (Western) region in Japan." +Takashi Yokoyama manager of GTUG Chugoku saw my email saying that I wanted to run this crisis response hackathon, and 4 hours later he had already negotiated and nailed the venue and made it available to announce to public. He was in fact joining another developer event on that day, so started to announce the hackathon and called for attendance right on the spot. I sent an email to Kyushu GTUG at 3/18 8:56 PM, and one of their members +Shinjiro Watanabe replied to me at 9:29 PM (only 30 minutes later!) that he has already reserved the venue and ready to run the event. In Shikoku, it was hard to find the venue in Takamatsu and we almost gave up. But one of the members of Shikoku GTUG, +Yoshimasa Kawano wrote us an email at 3/20 3:33 PM "I know it's already last minute but can't we run a hackathon in Shikoku on 3/21? I can work on getting a venue in Tokushima. If there is minimum 3 people willing to attend, it's worth trying." This was awesome call, and Shikoku venue came to reality. I would like to thank all of the GTUG managers and members. 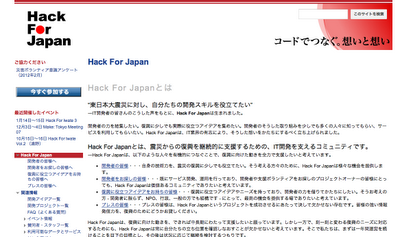 Without your help, Hack for Japan hackathon did not exist. So we announced the event on 3/19, and the ideathon started on that day, and hackathon was going to be held on 3/21 which was only 2 days later, and it was a national holiday, Monday after the weekend which most people would naturally have had holiday plans. So it was very hard to attract developers to come to the hackathon. "Would any of you please come to Kyoto to join the hackathon?" I sent an email to the GDEs at the last minute- on 3/20 12:46 PM. Heroicly, many of the GDEs +Shumpei Shiraishi +Makoto Anjo +KOMATSU Kensaku and +Atusi Nakamura all replied "I can go!" "I can go!" and got on the bullet train to come to Kyoto. Those GDEs were leading many of the projects at Hack for Japan, from suggesting the project ideas to leading the actual development. I would like to thank all of the GDEs. 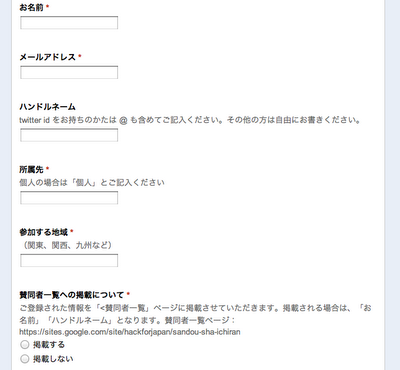 Without your help, Hack for Japan hackathon would not have been successful. We organized the event solely by using existing technology. If we were to build something new, we were unable to organize in such a speedy schedule. * We used Google Form for registration. 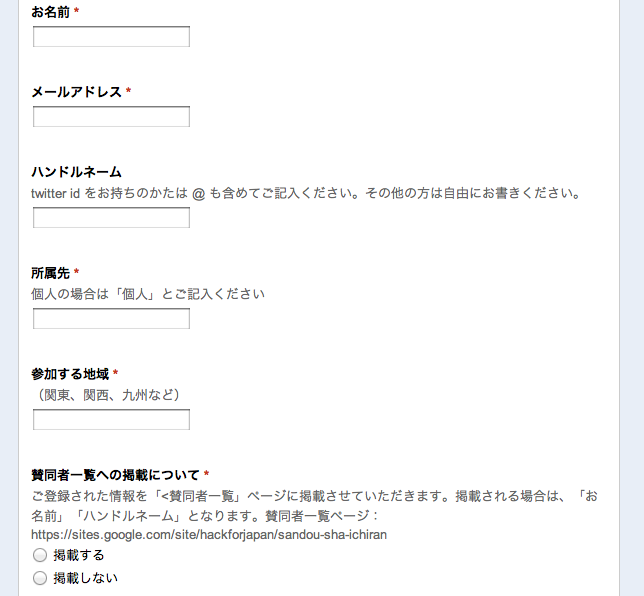 Great thing about Google Form is that if you are creating a simple form, you can do that in 2 minutes. If you get the participants fill in their names and venue they intend to attend etc, data will be collected automatically. Very convenient. 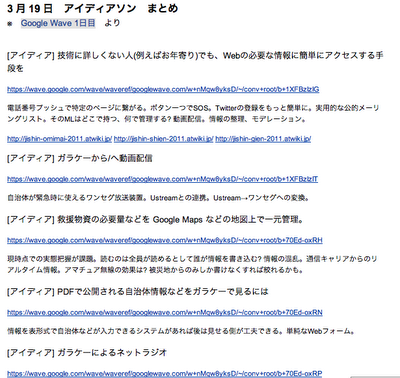 * We used Google Wave to discuss project ideas (Ideathon). It only takes 3 minutes to start a Wave. Once we had the thread, many people started to post their ideas and responses, and the thread got richer and richer- in fact we had 1,273 comments. 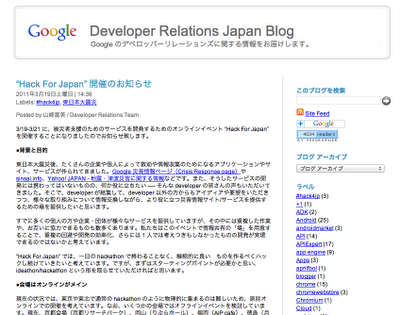 Immediately after I wrote an email that I was "thinking of using Google Wave", Atsushi (GDE) replied "OK I started Google Wave for you!" it was super super super fast. 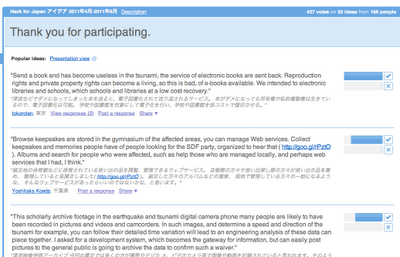 * We used Google Moderator to vote on ideas and consolidate the discussions. You can make one in 1 minute. Anyone can post ideas and if you find an idea that you agree with, you can vote "I agree!" with one click. 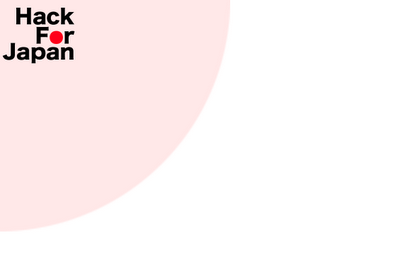 We had 537 participants post 237 ideas and 5,269 votes. * After ideas were getting consolidated, we used Google Spreadsheet so that we can get the ideas in one place as a project list, easy to view. You can make a spreadsheet in 1 minute. We got the project leaders to fill in their project names, abstracts, name of the leaders etc, and members who wanted to join the projects could add their names under those projects. * After a while we had a lot of information about various things, so created the official website using Google Sites. You can make a website in just 3 minutes. * In order to share the code, we used Google Project hosting as the repository. Before I even thought about preparing the repository, Daisuke (GDE) emailed me "I made Hack4jp repository so let's use this!" That was super fast. * For live streaming, we used Ustream. Some people were afraid we shouldn't use a lot of bandwidth during crisis, but I talked with someone from telecom (I used to work in the telecom industry...) and got assurance that it will not be a problem, so we livestreamed the event. * For announcement and PR, we just used our blogs. 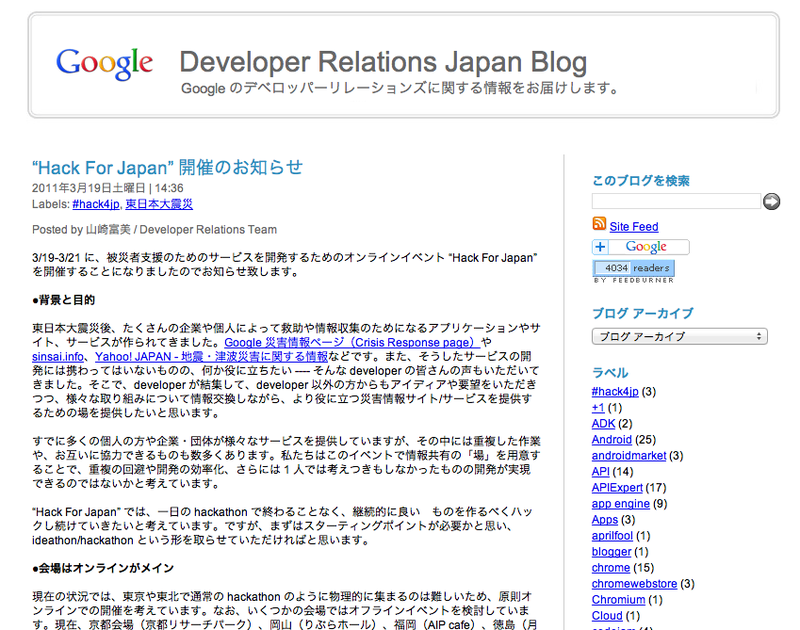 We didn't issue any press release, but many people saw the blog post that we put together on Google Developer Relations Japan blog, Yahoo Japan Tech blog, Recruit Media Technology blog, etc and helped to promote the event. Thanks everyone! 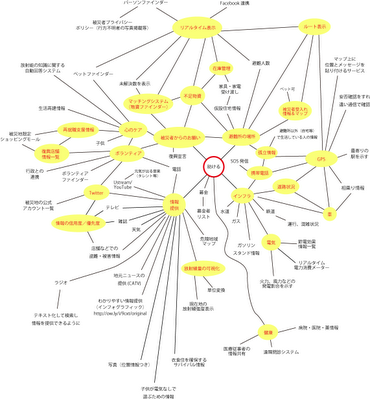 When Atsushi (GDE) saw my email asking for them to come to Kyoto, he immediately got on the bullet train, and on that train, he created a logo and sent me an email from inside the train "I made the logo of Hack For Japan in the train!" Nobody would think this logo was created on the day before the event, inside a bullet train! 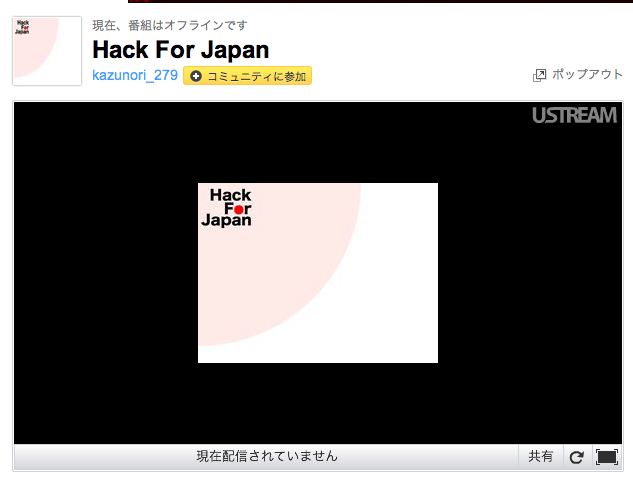 This logo is still used everywhere as the symbol of Hack For Japan. +Kazunori Sato who is ex-GDE and currently a Googler saw the logo and replied "Hey I can do livestream for you" and brought his livestreaming equipments and set up livestreaming account on 3/20 7:42PM- the night before the hackahton, and when I saw the account setting, the brand new logo was already embedded there. They are super super fast in getting things done. When we started the ideathon, the amount of ideas posted on Google Wave and Google Moderator increased exponentially, and summarizing the contents was crucially needed. Honestly, I was juggling the whole thing and did not have any time to summarize the content- then +Dai MIKURUBE a Googler who was in U.S. then, took advantage of the time difference and while it was night time in Japan, he quickly created a summary of ideas posted on Wave. It was like a magic- thank you Mikurube-san! 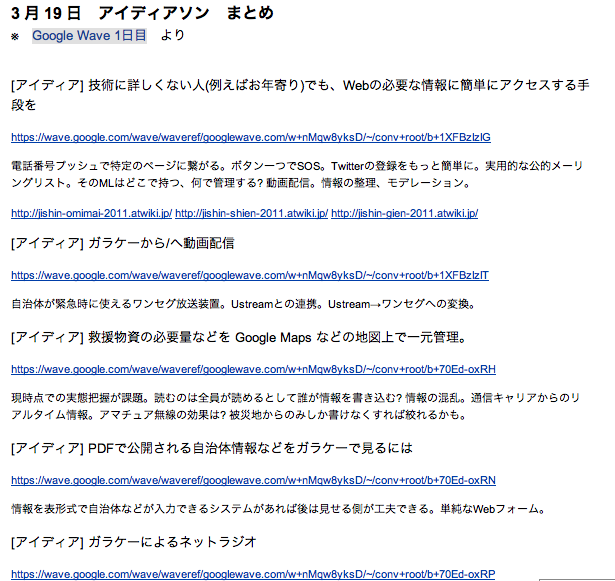 Also +KaZuhiro FuRuhata one of the GDEs created a summary of comments on Google Moderator. Another magician! Thank you Furuhata-san! 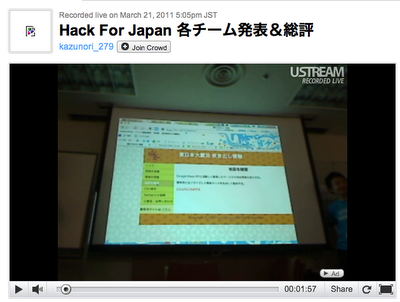 Due to so many people who helped in various ways, Hack For Japan came to existence. Many many thanks to everyone who helped! The difficulty of this project did not come from technology, but the nature of the event itself- we anticipated that from before the event. Before you announce, you should probably clarify that this is not a single-shot event, and that the presentation at hackathon is not the end-goal. Usually at hackathons, it is inevitable that the final presentation becomes the end-goal, and many of the functions end up not fully developed. Of course it is good to release the services that are finished, but we should make sure that we let the participants know that for this event, the goal is to "build a service that really is useful for people in Tohoku, and that we support Tohoku using technology. If needed, they need to continue developing and/or updating data in the long term." "Normally at hackathons, we create things we want to create. This hackathon is different. The product does not have to be flashy. It is our mission to create products that we know for sure that it will be useful, and develop quickly. We shouldn't be trying to develop everything- we should focus our limited resource on things that matter, and get robust and quick results." "Maybe the word hackathon might bring prejudice. Let's use the event title - Hack For Japan - as icon. 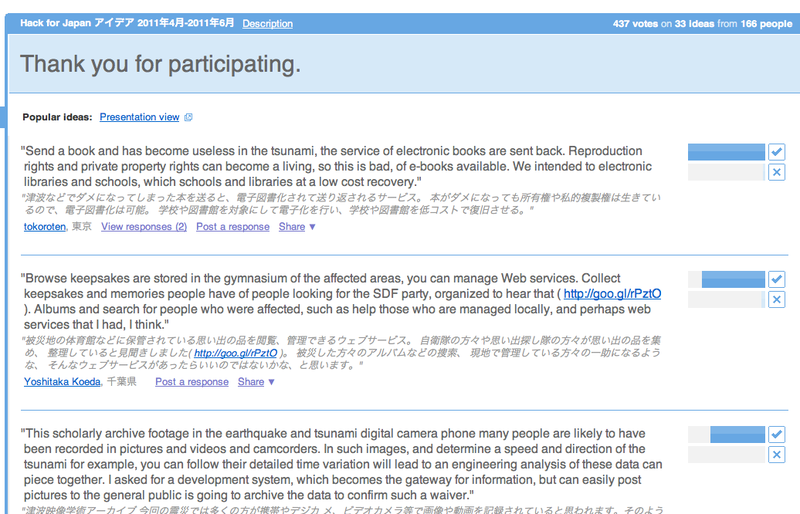 Hack for Japan should provide an environment where people in Tohoku can post their requests online, people can vote on requested ideas so that we can focus on higher priority problems, and engineers can focus on developing them. It's about that whole process- which does include ideathon and hackathon as a portion of that process, but one-day hackathon itself is not the goal. We want people to think about Hack for Japan projects in the long term." Hackathons are just triggers, and the most important thing is to create something that is useful and needed by the users, quickly create them and launch, and even if we don't create something new - hack through using multiple existing technology to solve the problem. Don't wait till the next hackathon to happen, but to continue developing important services even if hackathons don't happen. More than 2 years have passed since the disaster, and the stage of the issues has changed drastically. 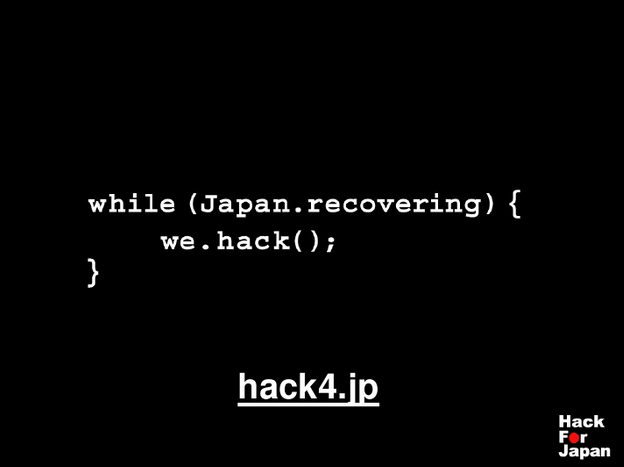 We are approaching the problems in a different way, but we have one commitment which is the slogan of Hack for Japan... we will continue hacking till Japan recovers.